Either use like a normal pair of hedge shears, or extend the handles and make these into useful long reach cutting tool. 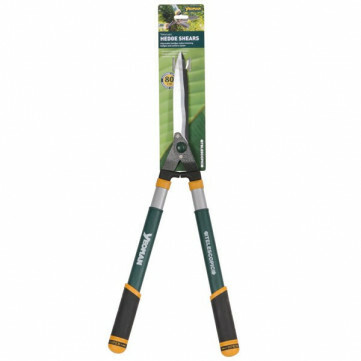 The telescopic hedge shears features oval comfortable grip handles. Particularly recommended for cutting hedges and conifers - non-stick blades reduce friction to give a good, smooth cutting action. This clever tool makes all cutting jobs within easy reach. The new telescopic system operates with a simple click of the grip end, which both locks and unlocks the handles, extending it from 37cm to 53cm. (Total length 79cm).